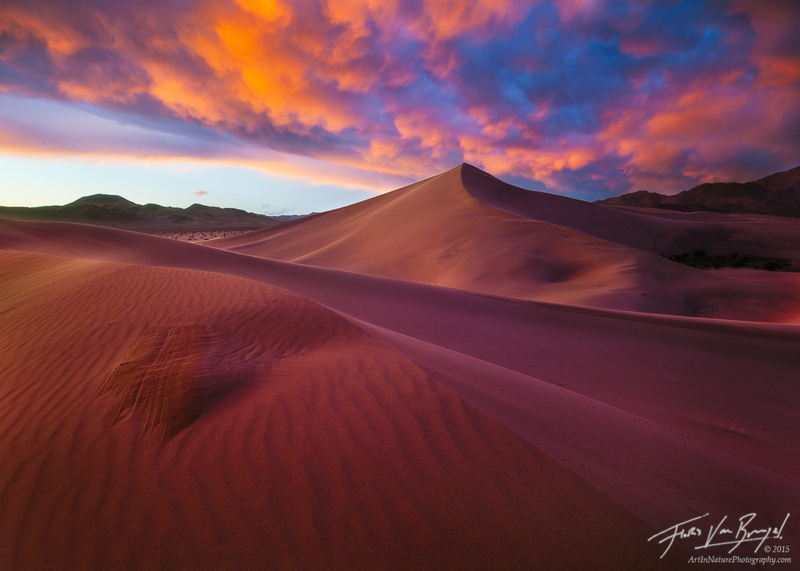 A clearing storm lights up at sunset over a set of remote dunes in California's Death Valley National Park. These unique structured clouds are called mammatus clouds. Fine art archival ink print on Glossy Baryta paper, which features a lightly textured rich and glossy surface. With the print, you will receive a separate signed certificate with information about the print. With this elegant and affordable mounting option the fine art print is professionally mounted to an eco- friendly HDF wood board and sealed with a special UV laminate, which protects the print and reduces glare. The finished piece hangs half an inch in front of the wall, appearing to float in the air. My framed prints are different from traditional styles, eliminating the need for glass. The fine art print is professionally mounted to a thin eco-friendly HDF wood board and sealed with a special UV laminate, which protects the print and reduces glare. The mounted print is set in a simple and elegant black frame, ready to hang, and enjoy under any lighting conditions. My favorite style, similar to the Framed Print above, but with a large deluxe frame (pictured left) that emphasizes the natural beauty of my photographs. Because there is no glass, there is minimal glare, making this option ideal for places with mixed lighting and large windows. With this stunning display method, a vibrant metallic fine art print is professionally mounted face-first onto 3/16" museum-grade UV protected and scratch resistant plexiglass. A french-cleat hanging system allows the print to float 1/2" off the wall. **International orders may incur additional shipping charges, please inquire for details.